There is nothing more quick and satisfying than baby knitting. 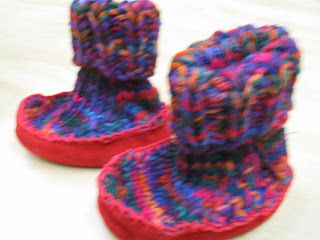 Every time I have baby knitting to do I am tempted to make at least 6 sets of booties or 3 hats or 2 sweaters....you get the idea. It's hard to stop!! Someday I hope to have grandkids and then I won't have to stop!! 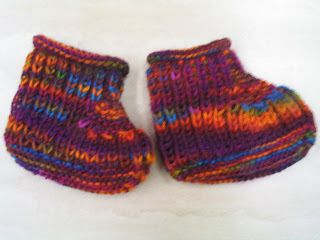 For now a cousin's son and his wife have a new baby and I have finished 3 sets of booties and 1 hat. Maybe next Fall when the little girl is older I will make her a sweater (or 2). 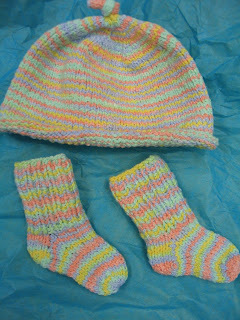 If you like to knit for babies and young toddlers watch for our newest Back To Basics patterns coming out this summer. There will be three really cute designs.